We’re now the proud owners of a brand new ice cream maker, and I decided to try out our new toy by making a flavor you won’t find in any ice cream shop I’ve ever seen — Thai tea ice cream. The results were fabulous. 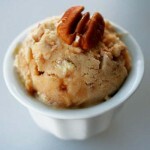 More of my ice cream recipes, including vegan sorbets. 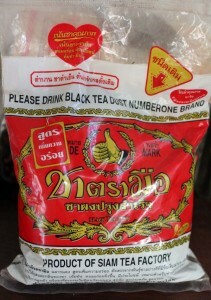 I picked up quite a bit of Thai tea (“black tea dust”) at a market while we were in Thailand this summer — 100 baht, a.k.a. 10 shekels, for two huge bags. Best buy ever. It took us quite a bit of time to figure out what we were looking for, given the language barrier, but one of the (many) people from whom we purchased this drink showed us the packaging, so I know this is it. I’m not exactly sure what’s in this tea mix, since the packaging is almost entirely in Thai. One market vendor offered us bags of jasmine tea, pandanus and stevia in place of the premixed thing; other sources list star anise as the spice; and I found a recipe that also includes orange flowers, vanilla, cloves and cinnamon. One thing I’m certain about, however, is that it includes food coloring — that bright orange sure doesn’t look natural, and I’ve seen it mentioned as an ingredient in several places. So, that’s the tea. Now for the ice cream. Since I didn’t actually know how to make ice cream, I consulted a book my mom gave me, “The complete book of homemade ice cream,” by Carolyn Anderson, published in 1972 and with a cover price of $1.25 (and now selling for $1.17 on Amazon). It has a few gems, such as the claim that ice cream can be used as a weight-loss tool (ice cream is not exactly the first thing that comes to mind when I think weight loss), and that molded frozen desserts are “glamorous” (again, not the first adjective that comes to my mind). It also has recipes for the world’s “richest” ice cream (truffles) and the world’s “most exotic” ice cream (flowers). But beyond that, it has about 300 other recipes. 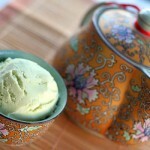 I used a recipe for tea ice cream as my reference (and changed it quite a bit). I decided to use egg yolks in my ice cream, even though many recipes don’t bother, because I wanted to make sure my ice cream was nice and rich. It seems to have worked, even though I curdled the eggs and milk while cooking them into a custard. In the end, this didn’t matter, since the final product somehow came out soft and perfectly smooth. These quantities make a little more than 1.5 quarts of ice cream, since that’s about what my machine holds. Start by infusing the tea — heat the milk just until boiling, add the tea, and let steep for several minutes. (In the photo — the tea, right after I added it to the milk, but before I mixed it in. That food coloring is gorgeous.) Then, strain out the tea, and pour the milk into a thick-bottomed pot. Mix in the sugar and salt. Now for the yolks: Starting with the yolks in a separate bowl, mix in warm milk bit by bit, so that the egg doesn’t wind up cooked. Once the yolks have been properly diluted with milk, add the mixture back into the pot. Cook over a low flame (many recipes called for a double-boiler, but I used a thick-bottomed pot) until the mixture thickens and coats the back of a spoon. Don’t let it boil. 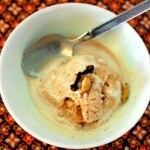 (Mine boiled, just a bit, and the mixture curdled — but the ice cream came out fine anyway). Many other recipes call for straining your custard at this point, but I didn’t. Let the custard cool a bit, and then add the cream. Let the whole thing fully cool in the fridge. You can even stick it in the freezer for a few minutes (don’t let it freeze) before putting it in the ice cream maker — the colder it is, the quicker it’ll set into ice cream (and the less likely it is to overly defrost your ice cream maker’s freezer bowl. Then, give it a whirl in your ice cream maker. It took ours 30-40 minutes. 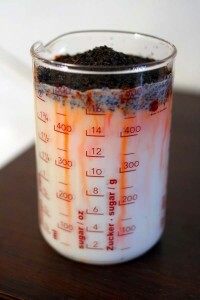 Once it has the consistency of a thick milkshake, stick the ice cream in the freezer for a few hours to harden. Serve, preferably with a whale ice cream scooper (thanks, mom!). The entire batch has about 2250 calories in it, which means if you divide it into 10 portions (which I think is reasonable — we’ll see how long it lasts us), that’s about 225 calories per serving. 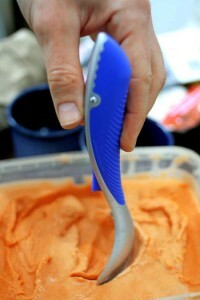 11 Responses to "Thai tea ice cream"
THOUGH IT SEEMS TO ME THAT IT IS VERY COMPLICATED TO MAKE! Now I wish I had made room in the freezer for the ice cream maker. You can also thank Carolyn for the scoop – she fell in love with the entire collection. It would have been worth your while! And no, it’s not all that complicated … you just have to take some time to cook the eggs. Liz, the ice cream color look yummy but what really concerned me is that should we eat tea with lot of color in it? I understand your concern. There are a few things you need to consider. First, you need to figure out what kind of coloring is being used. If you’re buying Thai tea powder in your home country, it should have an ingredient list in a language you understand, and you can check what the various coloring agents are — it’s entirely possible that they’re from a harmless, plant-based source. If it turns out it’s a chemical coloring agent, or you can’t read the ingredient list, then it’s a matter of your own judgment. How much artificially colored food do you consume overall, and how frequently do you drink Thai iced tea? I personally feel that since I consume very few processed foods, a few glasses of Thai tea here and there won’t do too much harm, even if the coloring isn’t from a natural source. But that’s a decision each person needs to make for him or herself. I just stumbled across your website. It’s absolutely fantastic and I’m totally motivated to make several of your recipes. 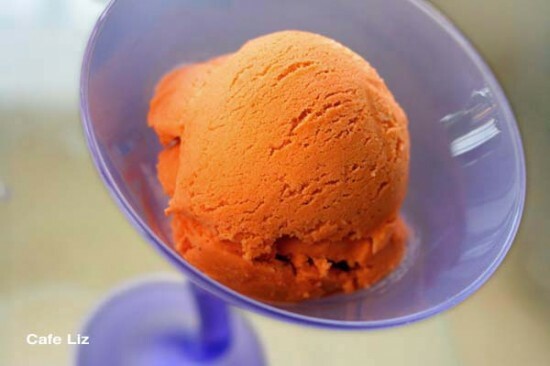 I LOVE Thai tea…and the only thing better than Thai tea is Thai tea ice cream. Wow. I bought an ice cream maker yesterday just to make it. So excited, thanks Liz! i used Stevia extract as a sugar substitute because i am diabetic. Stevia is really sweeter than sucrose. I’m going to try your recipe this weekend. I’ve looked at a few Thai tea recipes online and yours makes the most sense to me. I like your idea of infusing the tea directly in the milk. Good luck! I’m not sure what other recipes are out there, but glad to hear you liked mine. BTW, if you’re looking to simplify things, you can drop the egg yolks; it won’t be as rich, but it’ll still work.